The standard version of the Galaxy S8 Plus, which launched in India back in April, has 4 GB of RAM and 64 GB of storage. As you may know, there’s also an additional version of the flagship available that offers 6 GB of RAM and 128 GB of space. This is currently on sale in China and South Korea, but it will soon be available in India too. You’ll be able to pre-order the high-end smartphone in the country from June 2 via the Samsung Shop and Flipkart, with sales officially kicking off on June 9. It will retail for Rs. 74,900 and come in the Midnight Black color option. For comparison, the standard variant of the Galaxy S8 Plus retails for Rs. 64,900. To boost sales, Samsung is also giving out a free wireless charger that’s worth Rs. 4,499 to customers who purchase the smartphone. The Galaxy S8 Plus is one of the most popular high-end smartphones on the market right now. It features a 6.2-inch screen with a resolution of 2960 x 1440 pixels that’s curved on the sides. It is powered by the Exynos 8895 chipset and comes equipped with a 12 MP primary camera and a selfie snapper that has an 8 MP sensor. 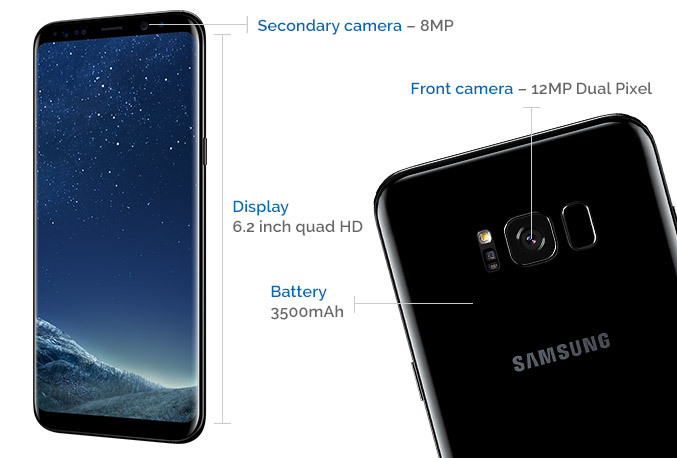 Other features include a fingerprint scanner that’s located on the back of the device, water and dust resistance (IP68 rating), a 3,500 mAh battery, and Samsung’s own Bixby digital assistant you can launch with a dedicated button found on the left side.